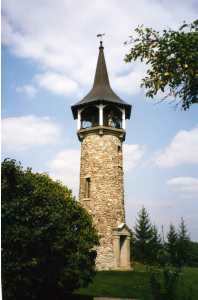 The tower was completed in 1926 to celebrate the German origins of the region, particularly to memorialize the (Pennsylvania Dutch) and Mennonite settlers who settled here in the early 1800′s. At the edge of the nearby bluff is a small pioneer cemetery where members of the Schorg (Sherk) and Betzner families are buried. The historic Detweiler Meetinghouse created in 1855, located one kilometer straight west of Roseville is the only surviving stone meetinghouse built by Mennonite pioneers in Ontario. This was a time when love for God was evident in the love and respect for one’s own family, and neighbour while caring for the land. 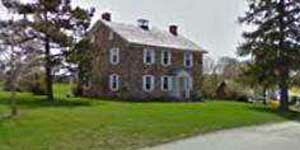 This historic farm house is on the University of Waterloo, north campus. Today the beautifully preserved home has become a landmark overlooking Columbia Lake and the University of Waterloo playing fields. The strong simple architectural lines of a past era contrast the modern lines of buildings on campus. * Become acquainted with the Pennsylvania German heritage of Waterloo County. * Learn first hand from knowledgeable tour guides about the life of a Pennsylvania German Mennonite family during the mid-nineteenth century. 466 Queen Street South, Kitchener. 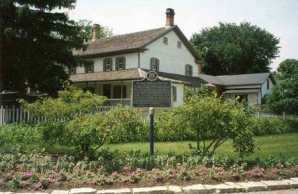 A National Historic Site and the farm home of one of Kitchener’s first Mennonite families. Costumed staff, special events and daily summer themes. Changing exhibitions in the galleries. West Montrose – a village in the Township of Woolwich, Region of Waterloo, Ontario. 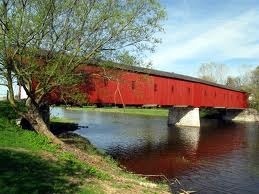 The West Montrose covered bridge was constructed in 1881 by John and Benjamin Bear and is best known for being the last remaining historical covered bridge in Ontario. These bridges were known colloquially as ‘kissing bridges’ since couples would be out of sight as they passed through the bridge. While the original bridge was constructed entirely of wood, in a series of repairs and restorations the bridge uses a combination of materials but retains its original form. In 1960 the bridge was recognized as an historic site by the Ontario Archaeological and Historic Sites Board and was designated as a heritage site in 1975. In 2005 the Region of Waterloo and in 2009 Woolwich Township, ON, the bridge, and surrounding forests, farmland and historical buildings were recommended for designation as an Ontario Cultural Heritage Landscape.